Oily and sensitive skin needs special cleaning.This gel based gentle scrub contains fine Jojoba beads & wheat germ oil along with other botanical nutrients that deep cleans the skin, removes excessive oil & dull skin cells without rupturing the skin. It also helps to improve skin’s elasticity and suppleness. Moisten face and neck. Apply Jovees Jojoba & Wheat Germ Scrub all over face and neck. Avoid contact with eyes. Massage gently with finger tips for 2-3 minutes using light circular strokes. Rinse throughly and pat dry. 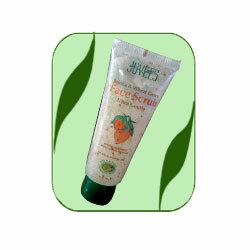 Follow with Jovees Aloe Vera Moisturising Lotion. Jojoba, Wheat Germ, Neem Extract, Date.